Hi all! I took a much needed break from my computer for a couple of weeks. A baby shower for a dear friend who became a grandma for the second time, was given at my home. I will share some of the treats and decorating from the shower soon. Special orders for house portraits have kept me very busy as well. Today my brain needed some down time so I painted this little canvas. Now what does that say about me? 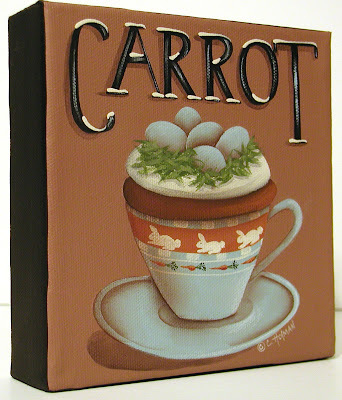 This little painting could be used to decorate for Easter or used year round. "A Cup of Carrot Cake"
A delicious moist carrot cake with rich cream cheese frosting is displayed in a charming little rabbit and carrot patterned cup and saucer. It is topped with a nest of green coconut and blue candy eggs. Black letting at the top spells "Carrot" and is dripping with cream cheese frosting. Yuuummm. I think a bit of chocolate with coffee this morning will fit the bill. You're so clever! This looks scrumptious! Looking forward to your sharing of the baby shower. I'll be participating in a few and it'll be good to see your ideas. Hi Catherine...I love this one. Carrot Cake is one of my fav cakes!! What a clever way to present it-wonderful job!! What a cute Easter painting! Oh this one is really a cutie! I love the cup motif. Oh, I love it, Catherine! Love carrot cake too! Wow, I know I've not done the rounds for a while, but your blog has had a real makeover! Spring cleaning? 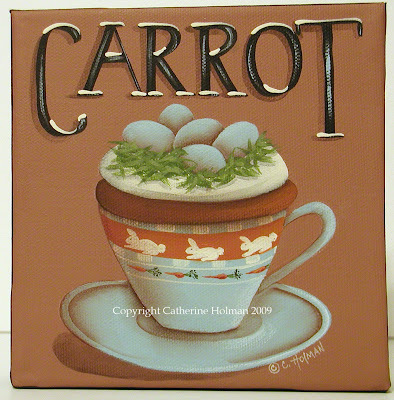 Carot cake is a particular favorite of mine, with a nice cup of earl grey tea, so I do love your latest painting!